This entry was posted in CA | Canada and tagged CA007 by ☼737.JD.Smith. Bookmark the permalink. Ack! Sorta reminds me of 2014 when Bill Lynes thought up the “Border Towns” theme and RenoJohn (or one of his lightly trained minions) thought it would be a good idea to make them worth WAY more points in January than later months. I bought it hook, line, and in-between-Pacific-snow-storms sinker. Come to think of it, the creator of this year’s thread, Timothy Allen, was all over those older bonuses and did this CAxxx thread. Coincidence? I think not ayyy! 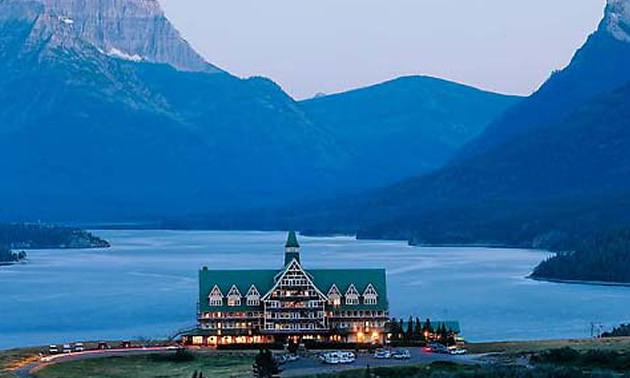 Sorry there wasn’t any view of Waterton Lakes JD….it’s stellar when it isn’t foggy. Stayed at the hotel two years ago myself. I was criss-crossing the border chasing the Border bonus stops Matt mentioned. After the 4th crossing my bike was essentially field-stripped by the US Customs agents. They said it was “unusual” for someone to cross so many times in one day. It took me an hour to put everything back together again. Back in 2014 I was admonished on my fourth or sixth crossing by the US agent looking at his computer & looking at the ice on the road. 2013 IBR Flint crossing after coming form STE ST Marie. *US Boarder Guard – Did you know that your motorcycle is registered in California? *Me – Hum yeah, I live there. *US Boarder Guard – How did you get your motorcycle here? *Me – Hum I rode it here. *US Boarder Guard – From California? that’s not possible. *Me – Well here I am. *US Boarder Guard – additional DA questions.